WELCOME to Shakespeare on the Map. This project is a work in progress that will provide resources for learning about and exploring the relation between Shakespeare's plays, early modern cartography (the study of maps), and the emerging global perspectives of Shakespeare's times. Shakespeare lived in a period of European exploration when Europe's understanding of world geography was changing and developing rapidly. This project begins with the goal of identifying the places referred to in the text of Shakespeare's plays and mapping those locations Initial work is currently underway to produce a new geographic markup of the TEI encoded Folger Digital Texts from the Folger Shakespeare Library. This geographically encoded, machine readable text will then be used as the basis for producing maps of all the locations in Shakespeare's plays and lay the foundations for future textual analysis of the role of geographic locations in Shakespeare's plays. As the project develops, it will also become a place to find resources about maps and exploration in Shakespeare's time, the 16th and 17th centuries, including a gallery of beautiful and fascinating images of early maps from the Newberry Library in Chicago. Read below for more about the ways you can learn and explore on these pages, or go ahead and click on the menu links above. Note that this is a work in progress, so look for more material to come soon. LEARN more about Shakespeare and his times by clicking on the "Shakespeare" and "Map History" links in the menu above. The "Shakespeare" page provides a short biography of Shakespeare and information about his plays, the theatres in London where his plays were performed, and the travel and exploration the English and other Europeans were undertaking at this time. The "Map History" provides a brief introduction to maps in this period as well as several images exemplifying maps from the time. EXPLORE the images of 16th and 17th century maps depicting the evolving European understanding of geography during Shakespeare's time, from maps of England, to maps of the world. Then visit the "Maps of Plays" page to explore Google Maps representations of the locations in each of Shakespeare's plays. 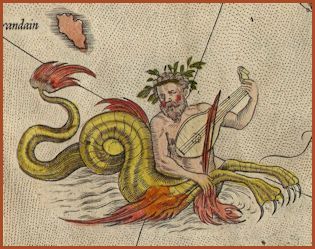 LEARN SOME MORE by visiting the "Sources" page for links and bibliography to outside sources about Shakespeare and early modern maps and exploration. The "About" page provides a more in-depth information about the different versions of Shakespeare's plays and the way this project approaches textual variations, an appendix on fictional places in Shakespeare's plays, and some brief information about the creator of this project.